in the Country (and the only one in the Mid-Atlantic Region to garner this honor). 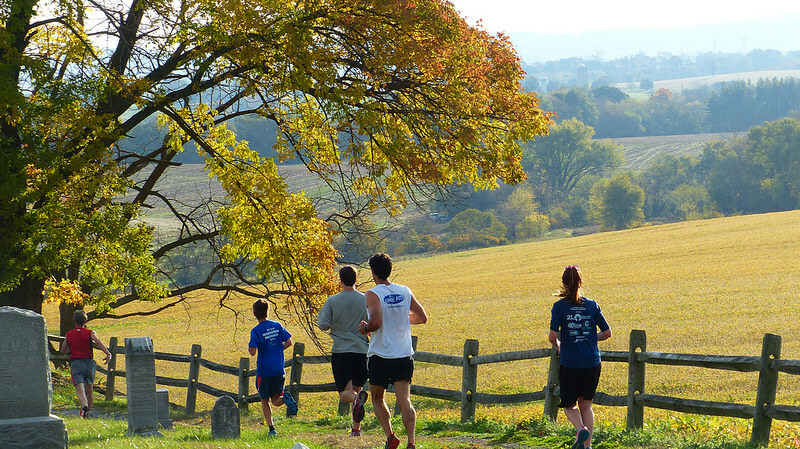 Come run "The BIGGEST little Race In Maryland" for yourself and see what all the fuss is about! A unique course through the scenic and historic town of Burkittsville, Md. 5The Spook Hill Cider and Wine 4 Mile Run is a benefit event organized by and for the benefit of the non-profit, South Mountain Heritage Society in Burkittsville, Maryland. The run utilizes a mix of road and cross country surfaces. 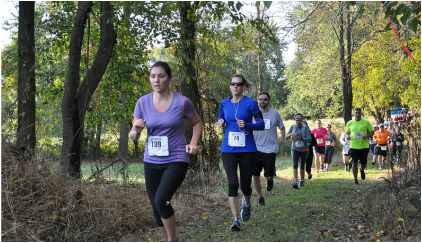 Participants will run (or walk) through historic Burkittsville, up the slight incline of legendary Spook Hill, into and around the Boordy Winery Vineyard, through historic Union Cemetery and the Distillery Lane Ciderwork's Orchard before finishing at the Burkittsville Ruritan Community Center. ​Note: Roads will be opened to traffic at 9:30. Walkers are asked to please be off the course by no later than 9:40. No strollers or dogs allowed, sorry. SWAG: Following tradition, all pre-registered entrants will receive a commemorative wine glass as their race premium. Finishers will receive wine-themed finisher's medals! Participants have the option of purchasing event technical shirts (9/25 order cutoff) during the registration process. Race Day (if bibs still available) -- $40, cash or check with no additional fees. A small transaction fee will be applied to race day Credit Card registrations. There are no added fees during online registration through October 15th! The 2019 race will be capped at 500 paid participants. Overland Timing will be chip timing the 2019 event. Wednesday, 10/16, 3:30-7:00 p.m. at Charm City Running, 467 West Patrick Street, Frederick, MD. Thursday, 10/17, 3:30 to 7:00 p.m. at Shoe Fly, Frederick, 220 Shorebird St., Frederick, MD. The main parking lots, start, and finish for the run are located at the Burkittsville Ruritan Complex, 500 East Main Street, Burkittsville. Parking will be at a premium, so please carpool if you can! 10:00 Award Ceremony concludes and Distillery Lane Ciderworks tasting room opens. ​Boordy Vineyards will most likely also be in Burkittsville offering tastings and sales on race morning. 11:00 The Little Red Barn Ice Cream Cafe in Jefferson (just off of Rte 340) open for business. For updates and information, see our Facebook page. Please give us a "like" while you're there! We will, as always, provide unique and interesting awards to the first three male and female finishers. The top Masters male & female runners will also be receiving unique awards this year! Age group awards will go 3 deep in the following age groups, M & F: 13 & under, 14 to 19, 20 to 29, 30 to 39, 40 to 49, 50 to 59, 60 to 69, 70 and above. We will again be honoring a mid-pack runner with an award unique to SMHS races. Our "Mean Runner" award has been renamed to honor a young, mid-pack runner who has shown guts and determination to make it to the finish line no matter what. The Jessie Gentry "Mid-Pack Maven" Award will go to a participant who finishes smack-dab in the middle of the pack (i.e. finisher 225 of 450 or 451). If there are an odd number of participants, the award will go to the slower runner. We will have plenty of door prizes. Some will be running related, some wine themed and some will just be downright whacky! We will be speeding the award ceremony/door prize process by assigning bib numbers to each door prize via a random number generation program before the run. After you finish, check out the door prizes and see if your bib number is on any of them-no lingering around post race, unless you want to hang around for the second chance drawing for unclaimed door prizes!